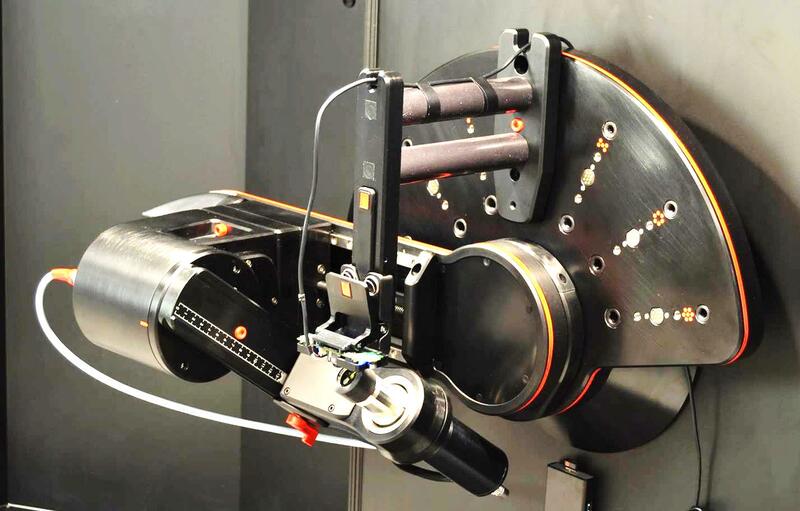 Flexible enough for the R&D lab while fast enough for production testing, the Meridian FLEX platform provides camera manufacturers and integrators with a powerful tool to meet their testing needs. 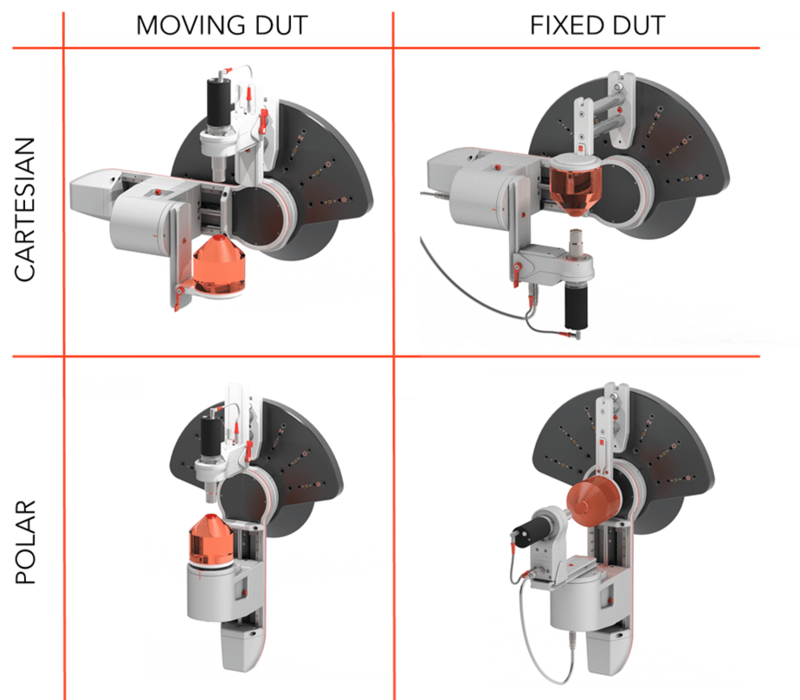 At its heart is a high-speed high-precision robot that can place a target at any specified field point in a variety of different instrument configurations. To begin with, there are two coordinate systems for precise target pointing: Cartesian (uncoupled pitch and yaw), and spherical polar (azimuth and zenith). The Meridian® FieldPoint software takes care of the tricky math, so coordinate transforms are performed seamlessly! The robot then either points the target projector at the Device Under Test (DUT), or points the DUT at the target projector. And finally, there are split configurations in which one motion axis is assigned to the DUT and the other to the target projector. Selecting the appropriate configuration depends on the maximum field of view of the DUT, the DUT housing geometry, the size and proximity of adjacent support electronics, and convenience. An important advantage of mounting the DUT to the robot is that it may then be pointed at optional stimulus stations other than the target projector, thereby enabling the assessment of parameters such as veiling glare, signal transfer function, and chromatic characteristics. The standard optical source for testing is a Meridian® Focusing Target Projector (FTP), which is used in the measurement of Modulation Transfer Function (MTF) and geometric imaging parameters such as distortion. Prior to testing, an FTP of a focal length suitable for the DUT is mounted in the FLEX. FTPs are easily interchanged, and mount into a small annular roll stage that serves to set an appropriate angle between the target edge and the sensor pixel array at each field position. Future product offerings will include target projectors for measuring LWIR cameras. In configurations in which the DUT is mounted to the robot, free cabling is minimized by the provision of USB3 and Ethernet hookups for retrieving the video signal, and DUT power on an adjacent connector. This is important since the robot is capable of making large moves very quickly. For safety reasons, and to minimize ambient light, the robot is entirely enclosed behind locking safety doors during operation. The entire instrument is floor standing and the height of the enclosed portion may be adjusted for the standing or seated comfort of the operator. Camera assemblies differ in their optical characteristics, their mechanical interfaces, and their electrical interfaces. The mounting scheme for any given DUT will necessarily depend on the specific features of that device, but generally comprises a standard riser assembly furnished as standard equipment and a custom DUT nest usually provided by the user. In some cases it may even be possible to print the nest. Specifications for the Meridian FLEX platform are not easily summarized because so many aspects of the instrument are configurable, and because many parameters are coupled. For example, a large DUT may shorten the travel range of one of the motions in a particular mode. Given the number of configuration modes, there is usually more than one way of setting up for a particular DUT. The specifications listed here are therefore abbreviated and serve as general cases. They are mainly mechanical in nature since the optical specifications are determined by the FTP or other stimulus source that is used. Our engineers are always ready to answer specific questions about your DUT and the applicability of this platform for your testing needs.